Nuclear weapons. Dictatorship. Communist. Secretive. Kim Jong Un. Totalitarian. What words come to your mind when you think of North Korea? With continued fears about the threat of nuclear weapons, North Korea is frequently featured in major news outlets both in the U.S. and abroad. North Korea is one of the most isolated countries in the world with very little information about what goes on in the country. Only through the few accounts from defectors and human rights organizations are we able to have a glimpse of what it is like to live in such a secretive society. However, unlike other literary works about North Korea, The Accusation is unique in that it written by a writer currently living in the country. It is not a work of the government’s propaganda nor is it shrouded by communist ideology. 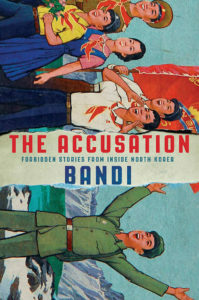 The Accusation is a collection of seven short stories and two poems by Bandi (pseudonym), a writer in North Korea. The book also includes an afterword which explains how the manuscript containing the collection was able to come out of North Korea. The stories were written between 1989 to 1995, towards the end of Kim Il Sung’s rule and the beginning of Kim Jung Il’s rule. Though each story has its own unique set of characters, they are interlinked in its criticism of the communist regime. The stories feature men and women from different tiers of society – some who are labelled “traitors”, others labelled “heroes.” Despite the ideology of equality, class distinctions are prevalent and privileges are granted only to a few. Through these characters, one is able to imagine what it is like to live in North Korea. Bandi’s use of intricate details about the setting, including the landscape and sounds, have the power to draw readers into the story and allow one to visualize what the characters themselves are seeing experiencing. The use of metaphors and nested stories within the individual short stories allow readers to experience the narratives in a more personal way. It almost feels like the characters are personally sharing their stories to the reader face to face or through a letter.